This year for the holiday season, Disney California Adventure has introduced the Festival of Holidays, an assortment of entertainment and dining experiences celebrating the customs and stylings of the holiday season around the world. 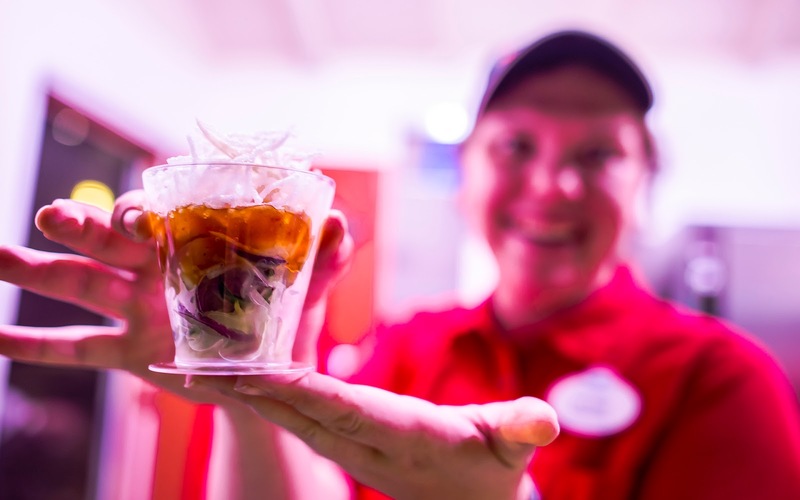 As part of that, the park has created a winter version of this past spring's Food and Wine Festival with an even broader menu of delicious items to tempt the taste buds. 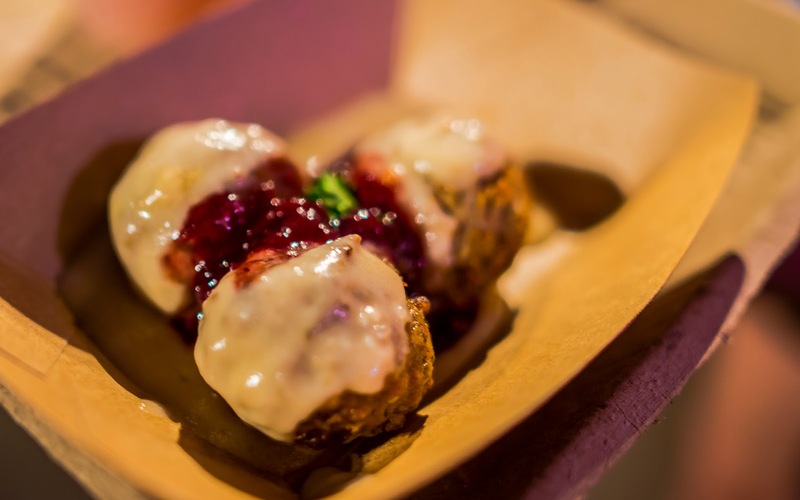 There are 14 total booths for the Festival of Holidays, six more than during Food and Wine, and guests can find scrumptious savories, delectable sweets, wintery brews, wholesome wines, select snacks. 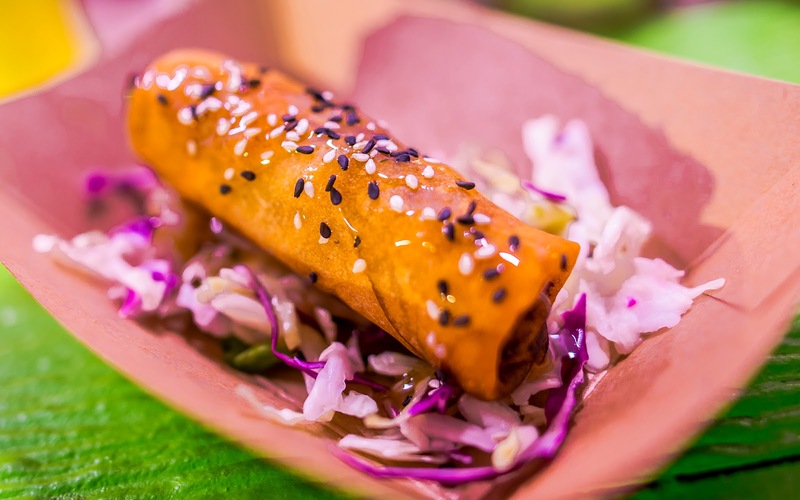 The small portions allow for a sampling of a variety of different dishes inspired by cuisines all around the world. The only downside is the price--with most items in the $6-$8 range for relatively small sized offerings, one's wallet may not be full at the end of the experience. But the food is pretty delicious, and it's well worth trying a couple of items on a visit. Here are a few items that I checked out last weekend. 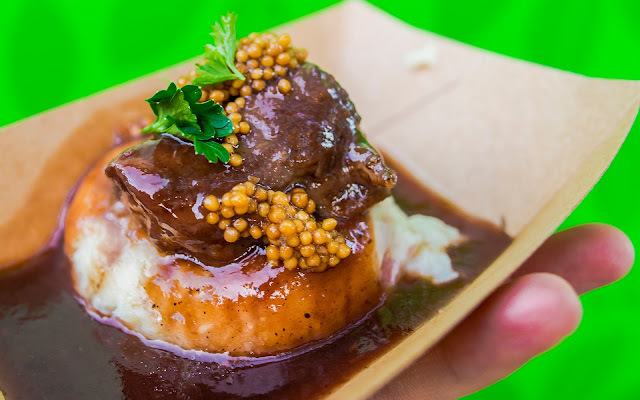 At the Heritage Cottage booth, the Braise Beef Short Rib with Smashed Potatoes and Sauerbraten Sauce ($8.75) provided probably my favorite dish of the afternoon. The short rib was tender and flavorful, and the rich sauce was an appropriate amount of savory. The couscous added a nice bit of texture to a dish that is worth the price. The the Mistletoe Morsels booth, the Holiday Swedish Meatballs with Creamy Brown Gravy and Lingonberry Sauce ($7.00) amounted to the traditional Swedish meatballs offering. The dish was quite tasty, with the tart lingonberry providing a nice balance. It would have been nice to have a couple more meatballs in the serving, though. I kept thinking of the value for taste of IKEA's Swedish meatballs in comparison. 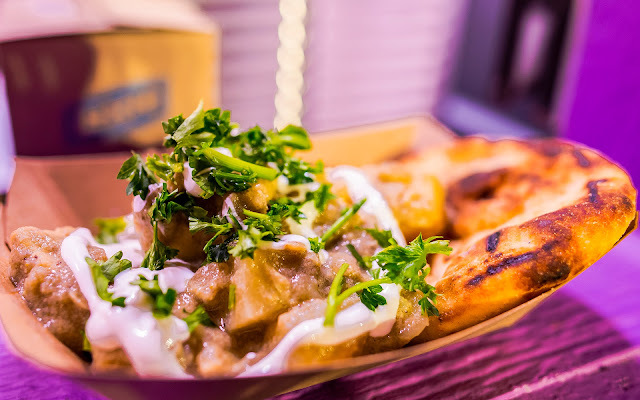 The Chicken and Potato Curry with Kefir Cream and Grilled Naan ($6.50), at the Spice Salutations booth, offered one of the best "filling to cost" ratios. The curry was rich with a bit of sweetness. My serving could have used slightly more cooked potatoes, but the chicken was tender and balanced lightly with the Kefir cream. The grilled naan bread complemented this carb-rich and hearty meal nicely. The next three items all came from the Good Fortune's Feast booth. This was the Adobo Pork Bao with Shaved Red Onion & Crispy Garlic Chicaron ($8.00). 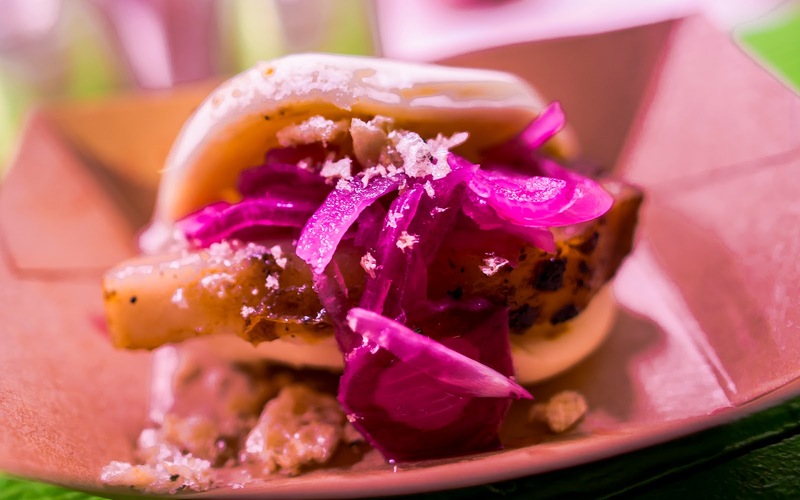 It was similar to the bao dish from Food and Wine, with almost smokey adobo pork balanced with the sour pickled onions. The garlic chicharon provided a nice crunch, but $8 seems pretty steep for a single steamed bun item, even by Disney standards. Also rather shocking in price was the Smoked Duck and Vegetable Spring Roll with Cabbage and Sweet Plum Sauce ($8.75). The roll itself was great--a great mix of meat and veggies with a sweet and sour finish from the plum sauce, but in my book (especially being Asian), there is absolutely no way to ever justify $9 for a single spring roll. For that cost, you can get half a dozen at any authentic restaurant, and even at Disney prices, I would have expected two or three rolls to be included. Finally, the trio of items from Good Fortune's Feast rounded out with the Chilled Papaya Shrimp Salad with Chili Garlic Vinaigrette and Crispy Noodles ($7.50). I though the papaya salad would make for a lighter dish compared to the heavier stuff everywhere else, but the vinaigrette ended up being rather overwhelming and the consistency more like sweet chili sauce. Don't get me wrong, I love sweet chili sauce--just not on salad. This was probably the most disappointing dish I tried. Finally, over at the Abuelita's Kitchen Booth, I had the Chicken Cilantro Tamale with Roasted Tomatillo Salsa Verde ($7.50), which actually turned out pretty good! 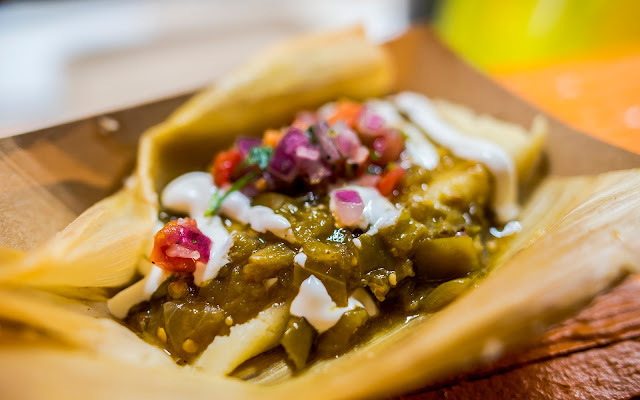 Once I got into the mix of all ingredients, the flavor profile provided a nice mix of the soft, starchy corn dough, crisp and refreshing salsa verde, and a bit of heat with the chili verde sauce. Although, again, $7.50 is pretty steep for a single tamale, at least it was tasty.